The Double Life of Veronika is a French-and-Polish-language film. While the film was directed by Krzysztof Piesiewicz, the original soundtrack (OST) was composed by Zbigniew Preisner who is a film score composer. Both, the film director and film score composer, have been working very well together for many films since 1980s, there is a long list indeed but not in here to account. 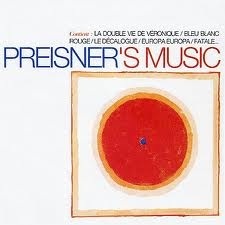 I have been "following" Preisner since he published a compilation album titled Preisner's Music (P's Music) back in 1995/1996. As I am still treasuring the immense musicality of P's Music after 1.5 decades of ownership, I have been hooked with certain spin-offs i.e. few OSTs. The Double Life of Veronika OST is one of the spin-offs. I have recently got hold of the original CD, no longer am I forced to listen with the CDR which I cut with the WAVs converted from the APEs. Why it took me such long time to have it added to my collection? Firstly, I was intoxicated with P's Music thus never did I come to think of getting the OSTs I have so far gotten and secondly, the ever-escalating prices prevailing in all the virtual shops may add on to explain. I guess it has become rather rare stuff, try check it out yourself, if so interested. The OST is truly Godsent counterpoint to the film, I reckon you agree had you watched it already or you will agree with me should you watch it soon. Most likely, even if one has yet to watch the film, the OST is just independently beautiful as does the music stand on its own feet without the film. The OST is unlike most other OSTs which offer excitement rather than enjoyment and you may have realised that excitement does not survive repetitive playbacks. From my 1st audition of the OST (CDR), the entire duration of ~30 minutes sounded outright familiar to me though upon confirming through the track titles of P's Music, only 3 tracks appear common in both albums. Why so? 3 tracks selected for P's Music could reflect the OST wholly? I suggest you to figure it out, if you are interested. With such good recordings, the music radiates vividly from the respective sources then decay gracefully into the air of the music venue. The presence of females in choir and soprano may be more than palpable. The vocals are elegant in their very own styles but please do not compare with that of certain classic figures like Joan Sutherland, Maria Callas, Montserrat Caballé etc, after all the OST is modern stuff. Tu viendras (sweet vocals of few presumably pretty ladies). Van den Budenmayer Concerto en mi mineur (elegant soprano exciting orchestra background). Solitude/Théme 2 Transcription (angelic harp accompanied by some of the lowest piano notes). Les Marionnettes/Puppet (dauntingly real solo piano presentation). Have fun in your quest, La Double Vie de Véronique- Original Motion Picture Soundtrack is about to tug your heart strings, so does your HEART Hear tHE ART!! !